Ideal for taking a big bit out of fallen trees, tree limbs and brush s, this Black & Decker LP1000 Alligator Lopper 4.5 Amp Electric Chain Saw delivering chainsaw-like cutting performance in an un-intimidating and easy to use tool. Equipped with 4.5 Amp motor, this unit ensures powerful, fast cutting. And its innovative clamping jaws are able to grab and cut in one easy motion. The jaws are covered by the rugged metal guards, protecting you from the cutting chain and immediately snap back over the blades once the cut is complete. Unlike traditional chainsaws that cut from top to bottom, this Black & Decker LP1000 Alligator Lopper 4.5 Amp Electric Chain Saw cuts side-to-side so the cutting chain won’t be buried in the dirt as the chain cuts through. In addition, the Alligator Lopper’s auto chain tensioning makes sure it keeps in top cutting form. 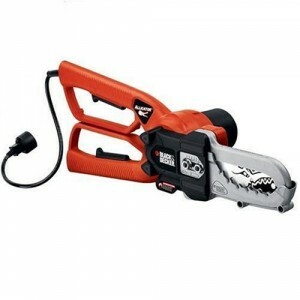 This Black & Decker LP1000 Alligator Lopper 4.5 Amp Electric Chain Saw comes with a six-inch bar length and with a weight of 6-1/2 pounds. Backed by a limited 2-year warranty.